Nestled within the Pocono Mountains of Pennsylvania, Bushkill Falls features a series of eight different waterfalls and an assortment of nature trails. You can wander across wooden bridges over roaring rivers as you discover each waterfall. Keep an eye out for the tallest, which plunges 30 m (100 ft). The trails provide different levels of difficulty, so for longer ones be sure to wear proper footwear. However, viewpoint over the biggest of the waterfalls is a relatively easy walk. For more information on the wildlife in the area, stop by the visitor center detailing the state's native flora and fauna. 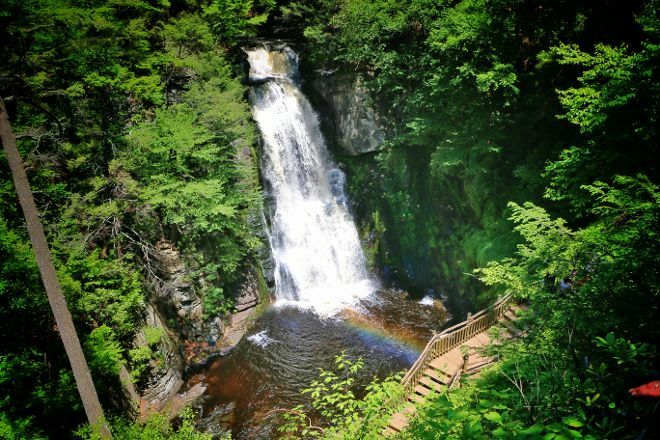 To visit Bushkill Falls and get the most from your holiday in Bushkill, create itinerary details personal to you using our Bushkill route planning app . A beautiful place! Very relaxing. Make sure to bring your camera for some great photo opportunities. The trail is easy with many steps and walkways that eventually lead to the Delaware Valley overlook. It's a beautiful sight during any Season. Get there early because the parking lot can fill up quick on a good day. Decent ticket prices. Well worth it. A great day out for all including family. The trails are well managed and marked properly. The entry fee is little higher and should be lowered. One will get a pamphlet with details about trails when buying tickets which is quite useful before you start walking. The main fall is within 5 minutes of walk from the entrance but for a good view of it one has to climb down.